Hi ! I was thinking from long back to launch a SEO Tools site and its finally here. 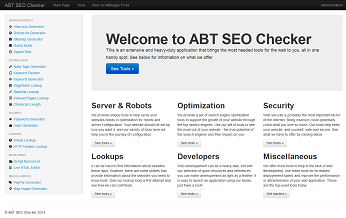 We have launched ABT SEO Checker. ABT SEO checker is a site in which there are numerous tools which will surely help you and your site. Today SEO (Search Engine Optimization) is essential for all the sites if they want to rank higher in SERP (Search Engine Ranking Position). Many a times sites and blogs with good content may be neglected and they do not get the deserved traffic and the reason behind this is poor optimization. One should add crucial things like Meta tags, Robots.txt and other important things in their website. Moreover webmasters should monitor their blog regularly in order to work in a better way and be the best in the competition. Sitemap Generator – Generate a sitemap for your site! Meta Tags Generator – Generate quick HTML meta tags. Keyword Cleaner – Organize and clean a list of tags. Keyword Generator – Get new keyword ideas for you! Character Length – Gives you lot of information about the entered text. Script Resources – Quick code resources like jQuery, Angular JS etc. Live HTML Editor – Code a website without reloading with our editor ! Give ABT SEO Checker a visit and I am sure that you will not regret for your action. Click the text below. Amazing I think ABT launched now its best product ever. I liked ABT SEO Checker, its provide almost all website analyzer tools at single place going to bookmark it now . :) Thanks ABT. Sir In My Site www.thesoftplanet.com, Using Your Robot Mode Tool, It Shows Nothing In Page Keywords, How To Put Page Keywords In My Blog ?? this is really very helpful for that guys who is new in seo. thanks for sharing it!! Hi, Can you make a post for stick navigation like yours and can you give the images in your footer? Very useful tool. Thank you very much. These are very useful tools for SEO, I need to save these so I can use it in the future.. Thanks for sharing! God Bless! I dint heard its name...but after reading your article..i've decided to give it a try..Thanks for the info! I think ABT launched now its best product ever. I liked ABT SEO Checker, Result its provide almost all website analyzer tools at single place going to bookmark it now . Nice collection. A few of them I have used.I was also looking for this kind of collection. You can add another SEO tools http://serplab.co.uk/ to check the result of Google SERP of any website. It also instruct me that what I have to do to develop my site. I have used many tools to check my site’s health in Google SERP. But it is totally free better than any premium SEO tools. I think your blog is truly awesome, fantastic and all of those fancy words. I’ve subscribed to your RSS-feed, and everytime you update your blog – I read the latest post… no matter where I am. It could be on my mobile or on my computer. It doesn’t matter. Your blog simply owns..... keep up the good work. Awesome tools, guys, I think I have seen this script somewhere before! Regardless, many of them are incredibly useful. very informative. learned a lot from this article. Really informative post. I am quite impressed to reach on your post. Great and useful post.Thanks for sharing this page. Thanks for your informative article. Your post helped me a lot in understanding the career prospects in search engine optimization.